The quality of their music is a given, but you should never under estimate the warmth that generates from a Kathryn Roberts and Sean Lakeman show. It is very much an open door policy into the world of this renowned duo, one well established as a premium UK folk act. You do not really need an excuse to catch one of their concerts, and they often tour outside the album release cycle when family commitments allow. On this occasion, the tour aligned to a new record, with PERSONAE getting its due rewards in the press when the delights were recently unveiled. The Midlands Arts Centre (known widely as the MAC) was one of the first dates of the tour’s second phase and proved to be more fruitful territory than a previous visit to Birmingham’s Glee Club. Over the duration of around an hour and half, a sumptuous serving of the traditional, gorgeous, enlightening and good old entertaining spilled out from the stage and set the scene for a successful evening. For fans that have seen Kathryn and Sean before, it was business as usual. Kathryn owns the vocal content in true inimitable style, contributing to the musical output via fleeting flute and rotating piano. Sean takes the trusty acoustic guitar perpetually around the block, always framing the mood of each song with precise chord structures and playing tempo. Whether nailing their compositions or arranging the traditional picks, the expected high standard never waned. Around half a dozen tracks from the new album featured during the pair of sets straddling the ubiquitous ‘commercial’ break. By a fair distance, the stand out song saw Kathryn on piano and a highly personal introduction to the beautifully delivered ‘Independence’. One of many revealing moments of the Roberts-Lakeman household and its extended family. This was closely followed by a song that Kathryn had considered putting into hibernation, but so many folks requested ‘A Song to Live By’ that it survived the cull. No doubt still inspired by gazing at the lyric postcard that has long become a merch best seller. Returning to the new album for a moment, ‘Tribute of Hands’ opened the show and ‘The Poison Club’ did likewise after the interval. ‘Seasons’ was introduced as an attempt at climatic nostalgia and pertinent on a record breaking temperature April day. Two traditional pieces from the album featured in the guise of the full-bodied ‘The Knight’s Ghost’ and the enlightening ‘Boney’s Defeat’. The latter segues neatly into ‘Old, Old, Old’ on the album with a symbolic reference to the island of St. Helena, but alas this one has not quite been primed for the stage yet. In contrast, a song perfectly suited for the live arena is the heart breaking ’52 Hertz’, which never fails to move once its background of miscommunication in the depths of the Pacific Ocean whale community, is shared. Joining this song from the duo’s back catalogue included the traditional pair: the foreboding ‘The Robber Bridegroom’ and the bawdy ‘Lusty Smith’. The third strand to the Roberts-Lakeman songbook is the occasional treatment of covers. On the latest album, Kathryn has returned to a lifelong obsession for the music of Sandy Denny and her version of ‘Solo’ sounds exquisite both on record and delivered live with piano accompaniment. In line with Kathryn and Sean’s love for the classic realm of the seventies American singer-songwriter, the closing number was a nod to the work of Little Feat’s Lowell George with a cover of ’20 Million Things’. This joined previous shows where they have celebrated the work of other iconic artists such as Warren Zevon. For the entirety of this tour, the Black Country’s very own folk ‘n’ blues picker Sunjay has entertained appreciative audiences in the opening slot. For thirty minutes this evening, an array of diverse material flowed from his acoustically stringed wand, ranging from old blues favourites to songs penned by his Stourbridge-based advocate Eddy Morton, plus an impish response to ‘playing some Bob Dylan'. 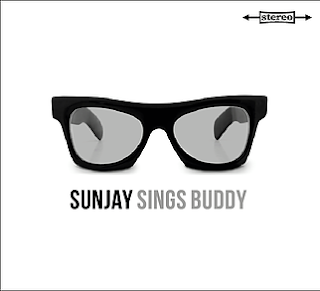 In true mischievous style, Sunjay teased the audience about a Buddy Holly number, instead guiding them towards his latest release SUNJAY SINGS BUDDY. This album was the result of appearing in a touring Buddy Holly theatre show last year. As adept as Sunjay has been in interpreting the work of Lubbock’s finest, this is just the tip of the talent he possesses. If you get the chance to see him live or listen to one of his records, where the song choice is more than interesting, you will not be disappointed. Kathryn and Sean’s appreciation towards Sunjay is as warm as the aura that they create in their set. You could almost be forgiven for acquainting with a small village on the edge of Dartmoor where they have put down family roots. The environment is obviously conducive to the flowing of creative juices and long may this prove to be fertile ground for quality music to flourish. While this Birmingham show, and all other dates on the tour, are primarily designed to spread the word of PERSONAE, you know that things will not halt once the word is out. Kathryn Roberts and Sean Lakeman have made superb music for many years and there is no sign of this drying up.